Last week, when I had the meetup with June (my website fan) and her daughter from Connecticut, the question came up as to the top schools in Jamaica. And so we started a healthy discussion. Today, interestingly, I got an email from Paulette - another ardent subscriber to my website asking again about the best school to send her daughter in Jamaica. And so today, I'm sharing with you the official ranking of the high schools in Jamaica - the most recent report! UPDATE! The 2018 report is now released! Click here to see it. THE TOP 100 HIGH SCHOOLS IN JAMAICA! The rankings are based on the performance of schools in obtaining five (5) or more subjects in the most recent CSEC examinations. The figures are calculated based on each secondary school enabling their cohort at the end of their 5 years of statutory education, to leave grade 11 with a minimum of five (5) subjects which includes English and/or Mathematics in the CSEC examinations. Well, here they are, sorted by the VERY BEST! Ranking	/ Name of school / Percentage (%) of grade 11 cohort attaining Five (5) subjects with English and/or Mathematics. AND CONTINUING WITH THE OTHER 61! Please note that these change almost every year as results are published. Note also that the rankings would also change if we look at results in particular subjects. That said, those in the top 40 or so will always give you value for money. Note: Click here to see the 2015 report. So what do you make of the rankings? Are you surprised? Is it fair? What's YOUR favourite school? I think it's time you stop this foolishness. I am not an educator, does not have your qualification like you, but can see so many flaws in your evaluation. I'm sure I can beat bolt in 100m if he decides to start his race when I reach the 60m mark. I could give many more reasons but don't have the time. I don't see school function as a mere exam passing facility. Jamaica has serious sociological problems. In my mind I think culturing these student to be responsible citizens, and changing our mindset would go a far way in addressing our indiscipline, which we are immune to, would go a far way in pushing forward. The school can play that role instead of leaving it to parents, who are far more indiscipline than their children. It would be quite interesting to see Campion taking the lowest passing grade PEP students with the same school environment and see what would happen to their CSEC result. It would also be quite interesting to see what are the changes to their school environment subsequently. Stop labelling these schools by merely taking exam results, you are doing more harm than good. Where are more private schools result. Did they not give info. I know of private high schools that is missing from this list. Congratulations to Greenpond High. If you just settle down 5 percent more each year, you will be far advance. Thank you dedicated teachers who continue to go above and beyond your call of duty. One challenge is the book rental system. Its now 3 months into the school year and still no rental books for some grade 8 students. Show me a list of the incoming GSAT grades against the CSEC results.The schools who took in average and/or below average children and made them into stars are the best schools on my list. The Morant bay high institution is a very hardworking and dedicated school which has shown improvement years after years and I just hope that the school will continue to progress and can reach even in the top 10!!!!! My school has children obtaining this from as early as grade 9. My school boasts a robust programme that has students excelling long after high school. Now when the kids get to grade 11 most are already qualified for college so when this is only gauged at the cohort doing the exam at the grade 11 level and not focusing on what the general population is leaving with I will have to ignore this site. My daughter (A. N-T W.) attends The Immaculate Conception High School and I am so proud of them in gaining first position in the CSEC examination for 2017. Well done and keep up the good work. 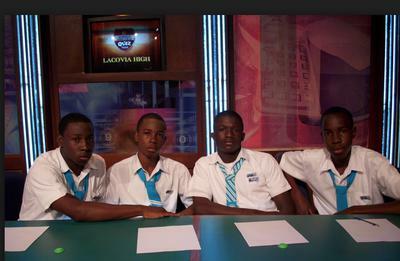 St. Elizabeth Technical High School my alma mater, continue to strive for the top position. i past for Mona and mi get 78.6? You idiots obviously don't read. This is a 2014 reading. It has changed now. when are doing your study check to see if the amount of student that start at 7 grade are there at grade 11. Some top rated school put out student who they thing will fail at the end of 4th form. On the other hand why cant the other schools teachers motivate more children to learn. Don't know if you explained how you got your data, But if your data is correct, any school with over 90 percent in that 5 subject including either math or English category must be applauded. Try the same study excluding the math or English criteria, but counting only grades A or B. I'm a KC OB. A little disappointed to see KC so far down, but it just means the KC OB Association needs to focus here. Don't think the school can do much more with the limited resources. I think St Hugh's High is an amazing high school. This school prides itself on all the great achievements of all their students and encourages all their students to strive to achieve their best. I LOVE MY SCHOOL. Congratulations to the students and staff of the Glenmuir High School. Hardwork does pay off. Glenmuir has I have known it is one that takes interest in the wholistic development of its students; teachers work to ensure that their students excel and bring out their best. Again congratulations on being no.# 1 in this region. DeCarteret College - top performing school in central Jamaica. Congrats to the DC's leadership and staff. Im so proud of my school.It might not be in the top 20 but its average is awesome. When will we realize that our educational system is tailored for females to succeed? Is the underperformance of males unique to Jamaica? Where in the world is there greater balance with male and female performance? Are we modelling the teaching methodology and curriculum there? My Daughter's School #1 Immaculate , But my Alma Mater St Hilda's 3rd! Could not be Prouder! Country School! Great school for educating and grooming young ladies. "City & Guilds" exams is becoming more recognized and its already accepted in many country including Europe and United States. I think Jamaica should look into develope schools in taking on this exams of which I hear its easier to pass and just as comprehensive. We need more male students to do well and maybe the "City & Guilds" will help them. The fact that many schools offer vocational subjects that are not examined by CXC, and therefore have their students sit these in City & Guilds, it would appear fair to me that the study should include the statistics for City & Guilds. After all, as a country, we are producing excellent high school graduates that can matriculate in institutions of higher vocational learning or go directly into the world of work, producing!! It would be nice to get this in csv format so it is more easily downloaded. Weh jago doing up deh suh? I too share the belief that MOE should send the empowered students to immaculate and campion for instance with the 5-20 % grades in g-sat and let them teach the 250 first formers and get the same results as now. Then u say excellent school with 100%passes . Starting this year September 2016 all top schools should get all the slow learners and create history in improving their status to grade A. It is important that the teachers in the other low schools be better paid than the top schools as their jobs are obviously harder. Give them better salary now than ones in top schools especially as they often lack the resources for growth in academics. Update! The 2015 report is out! Congrats William Knibb, the only way to go is up, up, up! While these young men and women have much to be proud of , a close examination of the results confirm some worrying trends amidst this otherwise bright spot (in jamaica). At first glance, "all female schools" dominate the top 10 performers. This trend is not new, but is present in GSAT performance and before that Common entrance exams. A 2007 study saw males representing only 20% of incoming first year students. I supsect if you should scrub the data (performance based on gender ) of all the other 90 mixed gender schools , girls outperformed their peers. Wow, Thanks! You can't get any better than this! The info is thorough and very helpful. I personally know several people who will benefit from this info. Thanks again my friend and keep up the excellent work. This Ranking is actually incorrect.This is actually the ranking from 2013. If this is the 2013 one im sorry.Im actually a Upper-6th Former At J.C And most of the 5th formers got over 80 last year Said by Ruel Reid,Our Principal. This ranking is not a measure of how "good" a school is but of how well it's grade 11 cohert performs on the CSEC exam. For a true picture of the quality of a school one would have to consider in addition to academic grades; student satisfaction survey, heath & safety, student culture, teachers grades, resources and facilities, extra curriculars & activities and sports and fitness. This is merely a quantitative picture of performance in an exam. Let us be reminded there are schools that allow students to sit up to four subjects in the 10 th grade. Those students may only then sit another 4 subjects in the 11 th grade. Also there are students who sit exams privately. Those things should also be taken into consideration. This poll is not recent wheel and come again!!! 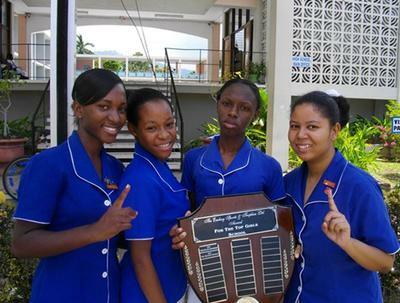 First wolmers girls and kingston college ranking is incorrect outa rubbish. Some schools do screening while others send all students who wish to sit the csec exam. That being said this ranking is not accurate. To make it accurate they would have to group the schools that do screening together and the ones that don't together. A school like Manchester High I know for sure gives everyone the opportunity to sit as many subjects as possible, while Bishops and DC that are ranked better in this send the "best" of the "best" to sit csec. BISHOPS --PER ARDUA AD ASTRA!!! big up to MY ALMA MATER BISHOP GIBSON HIGH AND OUR FELLOW ANGLICAN SCHOOLS DECARTERAT COLLEGE AND KINGSTON COLLEGE!!! 😬😬👏🏽👏🏽👏🏽😌😌 KNOX COLLEGE IS THE BEST!! And we came in the top 15 yaasss.mi know the other schools before us works really hard so congrats. But I'm proud as I graduated a couple days ago. Where is Munro on this list,can't be accurate. 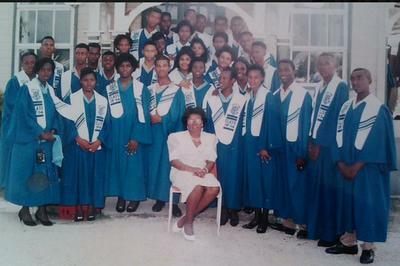 OMG look at my class pic.Mannings Graduating class of 93 5acqua with class teacher Ms. Rombolt. So how some ppl go on like Belmont over Mannings. Mannings all the way. Westmoreland's hope everytime. We are the best school, my alma mater !!! This is not accurate thou, Manning's cannot be ranked at 21. Educate Jamaica needs to take this down as they know that the information contained is inaccurate! I am a bit concerned about this survey. Not happy not sad. I love competition, but I hope the day will come when the disparity between schools is a lot less obvious. There is so many dianamics which can cause this disparity. We need to level the play field in all ways possible. For example some of these kids have too much responsibilities they nave no chance to be kids and focus on school work! There is no true way to rank the schools! It is like challenging a monkey, a fish, a goat and a cow to climb a tree. Its obvious who will master the task. This is the reason the MOE is implementing the vocational programs in schools. I am so proud of manning's high. We have all have excellent teachers and brilliant students. Only the best for manning's. How can you rank the schools based on a single exam sitting. Go do your home work and stop being lazy! Happy to see some things haven't changed. Glad to see my alma mater right up there in the top tier consistently - Go Mannings!!! !